"Exploring the Wonder, Wisdom and Mystery of Dreams and How They Can Transform Your Life"
Course limited to 15 participants. ​Do you wonder why we dream, and what your own dreams are really about? What's actually unfolding in your nocturnal adventures? In this immersive dream retreat, you'll discover just how significant your dreams are, how often you are previewing future events, and how your dreams can enrich and transform your life. Whether you are just beginning to explore dreams, or already work with them and want to go deeper, this unique retreat will help you tap into the amazing wealth of guidance, inspiration, healing, creative energy, and wisdom your dreams offer. As we nurture the body and spirit, awaken our senses and indulge our creativity, we'll explore how empowering dreams are, and how to understand and act on the messages they bring. Carmel-by-the Sea is truly a dream setting. Astounding views, stunning white sand shores, shimmering ocean sunsets and a night sky pooling moonlight over Carmel's charming European-style village and gleaming sea will make you feel as if you've stepped inside a dream. Even the fog rolling in off the ocean casts a misty, dream-like spell. The Vagabond’s House, a world acclaimed inn, is your host for this unique and magical retreat. Daily workshops, led by dream teacher and author Maureen Boyd Biro, will convene in the spacious and welcoming Carmel Woman’s Club. 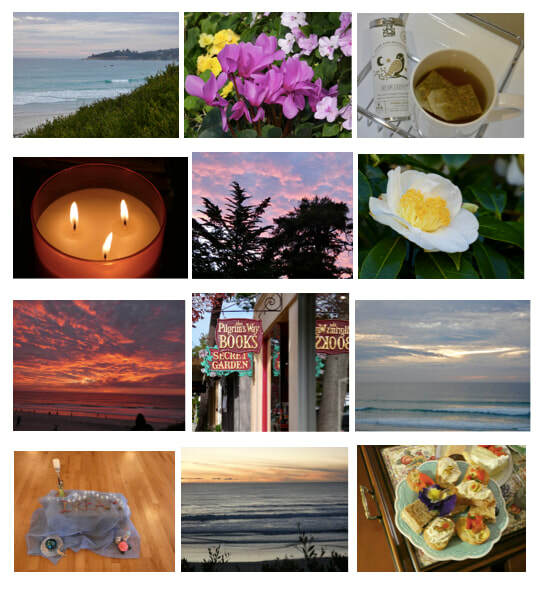 Weather permitting, we'll also meet at Carmel’s beautiful beach, or fireside in the courtyard of The Vagabond’s House. With world class accommodations, exceptional dining options, outstanding personalized service, and the passionate, inspiring guidance of a noted psi dreamer and teacher to guide your adventures, this promises to be a memorable and transformative experience at a top rated, vacation destination. 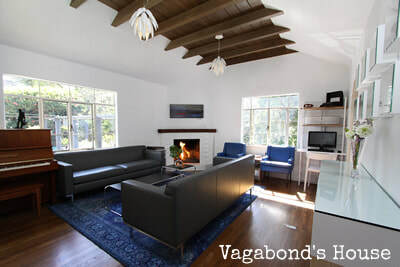 ​​The Vagabond's House is an exquisite Carmel gem. Discerning travelers will appreciate the meticulous attention to detail that seamlessly blends luxurious modern comforts with vintage charm, honoring the inn's unique artistic and literary origins. A magnet destination for creative seekers, The Vagabond's House classic Carmel design boasts a magical, rock courtyard with a cozy, fireside reception area, enchanting waterfall, artistically themed rooms, and truly outstanding service and staff. Located blocks from Carmel's famous beach, in the midst of the city's finest restaurants, art galleries and shops, The Vagabond's House brings devoted travelers back for exciting vacations and immersive creative sojourns year after year. Carmel is the place to awaken all your senses, refresh and restore your spirit, and prepare you for nights of sweet dreaming. Long walks on the beach, soothing massages booked directly though the inn, afternoon wine tastings or curling up with a cappuccino and your dream journal or a wonderful book, are just some of the delights awaiting you. Throughout the retreat, participants will create their own unique dream journals with a personal dictionary of symbols and themes, using a journal provided for each dreamer, and acquire skills and techniques to more deeply understand and work with dreams. Weather permitting, we'll convene outdoors for a magical, evening dream circle. Participants will be encouraged to try methods for setting dream intentions to solicit desired guidance or healing in dreams; mutual dreaming; or dreaming for inspiration regarding creative projects or life questions. Methods we'll explore include: dream incubation and recall; innovative ways to keep a dream journal; and different methods of dream interpretation, always employing a respectful attitude that "the dreamer is the expert of his/her dream." We will also discuss bringing your dream into being and ways to re-enter a dream while awake for continued exploration after the retreat. Most importantly, we'll explore the art of living your deepest and truest dreams. Each participant may schedule a 20 minute individual consultation with Maureen during non-course hours, or post retreat, to discuss any dream, or any aspect of working with dreams in private conversation. All participants must understand and agree that any dreams discussed during our time together are private, and not to be shared with anyone outside of this course, without explicit permission from the dreamer. Upon registration, links to online information on dreaming will be sent and book suggestions for some pre-retreat exploration, if desired. This is entirely optional but may be helpful to explore. An extensive library of dream books will also be available for your perusal throughout the week. As part of our dream sharing and exploration, a small altar of tokens and artifacts reflecting dream symbols or intentions will be set up in the center of our meeting space each day. Participants are encouraged to bring an item to add to this display. ​Example: You've had a dream about a bird that you feel may have been a visit or message from someone who has crossed over. You may want to contribute a feather to our dream display or a picture of the person you've lost. All items belong to the participant and may be taken back at the end of each day. All meeting places are within walking distance of the inn. Three days of instruction and dream activities from 9:30 a.m. - 4:00 p.m. Single or Double Occupancy Room Rates are available. Registration details and pricing below. If you are a local resident interested in participating in the dream retreat and special events, but don't require accommodations, please contact The Vagabond's House for registration availability and prices. A non-refundable deposit of $350 will be due on registration, with non-refundable balance due in full 60 days prior to retreat. Cancellation and trip insurance may be obtained at Allianz Travel Insurance. Contact Maureen Boyd Biro for further information about the Dream Course and Retreat Package. All other questions, please contact The Vagabond's House .